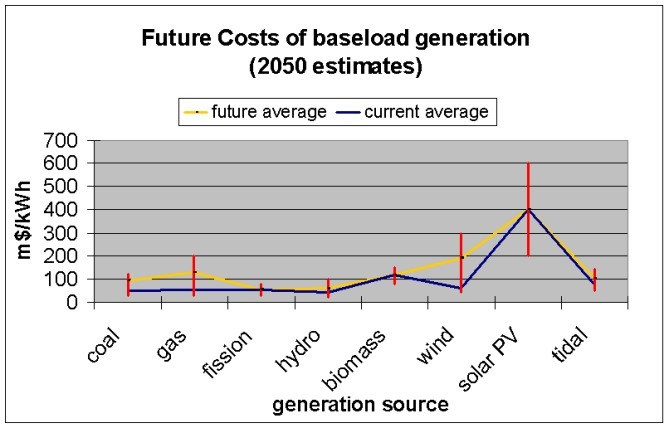 The Royal Commission on Environmental Pollution produced a report in 2001 titled "Energy - The Changing Climate" which identified a possible future requirement for "baseload plants: either nuclear or fossil fuel with carbon dioxide recovery and disposal" and a definite need for separate "fossil fuel plants to back up intermittent renewables capacity" and to "meet peak electricity demand". In order to reduce the requirement for fossil fuel or nuclear plants, and enable the Scottish Executive to meet it's renewables energy supply targets, it was decided that the possiblity of obtaining a reliable baseload supply from marine currents should be addressed. This chart is based on accurate figures to 2001 from SEEF. Further figures have been linearly extrapolated using current closure dates for power stations and Scottish Executive targets. The	"balance" area shows the percentage of the supply for which there is no current provision, and so which will require new plant to be built. Much of the plant which is expected to close has been acting as baseload. If renewables is to fill some of this "balance" area also, they will have to offer a reliable baseload or peak-matching supply. Coordinating a scheme of the size of the BSS may well require government intervention. It is generally hoped that if the long-term capacity declines as plant closes down, the resultant rise in electricity prices will send signals to firms to build more generation plant and reduce future demand by taking measures to increase energy efficiency. However, if this market mechanism does not occur, it may be that government involvement may be required, making the coordination of such a geographically dispersed large-scale renewables scheme as the BSS more viable. NOTES: Projections were taken from literature surveys and taking 2050 as a date for comparison. The present costs and projected costs taking into account anticipated changes in the European energy market were then calculated. Most optimistic parameters for plant design were excluded. It should be noted that it is likely there would still be an increase in the cost of biomass due to more stringent legislation requiring more expensive plant. It should also be noted that although hydro appears very competitive, the potential for development of this energy resource is much lower. These figures have not been double checked with other studies, but provide at least an impression of the part tidal current technology could play in the future. The importance of energy security derives from the critical role that energy plays in all aspects of everyday life - severe economic and social implications can quickly result from a breakdown in the energy delivery system due to the difficulty storing energy. The term “energy security” relates to the interruption of the energy supply as well as the risk of a breakdown. To ensure energy security, the diversification of sources of supply is necessary both in terms of the fuel type and its geographical region of origin. The European Union imports more of its energy (approximately 55% of its requirements), in the form of coal, oil and gas from outside its borders than it produces. 45 % of oil imports come from the Middle East and 40 % of natural gas imports come from the former Soviet Union. These areas are know fo their political instability. As energy consumption increases across Europe, this external dependence for energy imports will increase. It is estimated that in the next 20 to 30 years imported products will increase to around 70 % of the EU’s energy requirements. In economic terms, the consequences of this dependence are severe, approximately 240 billion euros (in 1999), or 6 % of total imports. At present only around 6% of the EU’s generation capacity is from renewables. The benefit of increasing this figure therefore goes beyond the environmental aspects. Europe has massive potential wind, water and solar renewable resources, which could be exploited to reduce the continents reliance on imported fossil fuels, in turn increasing energy security. The major weakness of electric power is that it must always be used at the exact time at which it is produced. Managing the balance of supply and demand is therefore a complex problem - resulting in the inherent monetary value of electricity changing by the hour. The supply-demand balance must be managed by ensuring enough generation. Electricity produced by generators is sold on the wholesale electricity market, where Electricity suppliers and traders buy their power from generators by signing bilateral contracts or through trading on power exchanges. In the short-term, the wholesale markets approximately balance supply and demand, with fine tuning then implemented by the National Grid (National Grid Transco or NGT). NGT ensures security of supply on a second to second basis, buying or selling between 2 and 5 per cent of electricity produced to balance the system. There are two main types of power sold to the grid - "Baseload" electricity and "Peak" electricity. Peaking generators are remunerated closer to demand-averaged prices, whereas baseload plant commands a lower price, but their market is continuous due to their set supply contracts. The 2001 NETA (New Electricity Training Arrangements) have a major impact on the electricity market. It has been said that "The NETA system is unfavourable to baseload suppliers that cannot respond quickly to peaks and troughs in electricity demand". The intermittent nature of the supply from some renewable generation also puts it at a disadvantage within NETA, under which fluctuating supply attracts a penalty. In addition, under the BETTA programme the England and Wales wholesale electricity trading arrangements will be extended by Ofgem and the DTI to Scotland from 2005.